And yet a fourth tornado was confirmed after NWS ground surveys found damage consistent with an EF0 tornado. 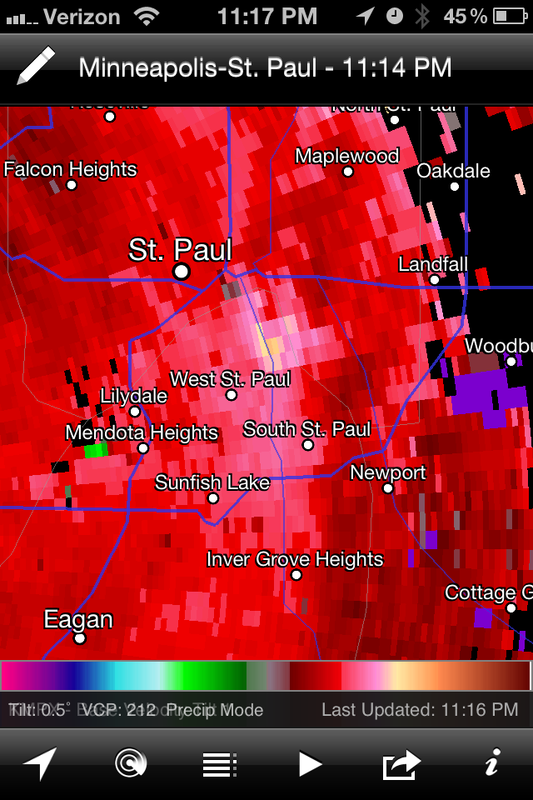 Appears some downburst winds were also found just prior to touchdown on the east side of White Bear Lake. 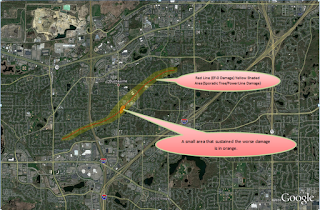 TO FOUR TORNADOES THAT OCCURRED SATURDAY NIGHT. STRENGTH RATING: EF-0 WITH 80 MPH WINDS. TO JUST SOUTHWEST OF THE INTERSECTION OF BURNSVILLE PKWY AND HWY 11. A GRILL LID WAS FLOWN ABOUT 200 YDS NEAR NICOLLET JR HIGH SCHOOL. 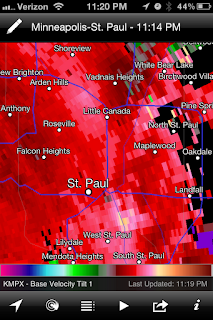 MAXIMUM WIND SPEEDS WERE AROUND 80 MPH. START LOCATION: NEAR SKYLINE DRIVE EAST OF HWY 13. 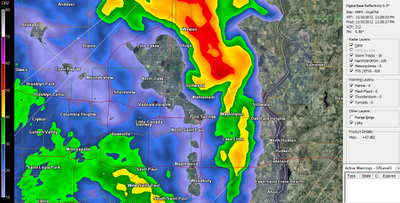 END LOCATION: LOST SPUR GOLF COURSE JUST SOUTH OF I-494. STRENGTH RATING: EF-0 WITH 75 MPH WINDS. MERGED WITH THE OTHER STORM. START LOCATION: 0.2 MILE SOUTHEAST OF HWY 13 AND WACHTLER AVENUE. END LOCATION: JUST SOUTHEAST OF HWY 13 AND SYLVANDALE ROAD. SHEDS. THE TREES EXHIBITED A DEFINITE CONVERGENT DAMAGE PATTERN. 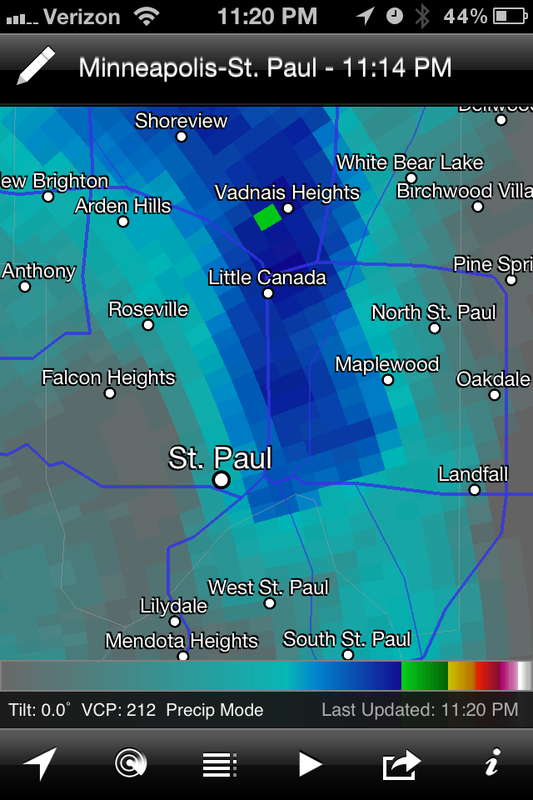 HEIGHTS INTO WEST ST PAUL AND BEYOND. END LOCATION: 2.2 MILES NORTHEAST OF GRANT. 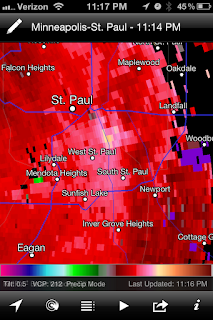 STRENGTH RATING: EF-0 WITH WINDS UP TO 85 MPH. OF GRANT. HUNDREDS OF TREES WERE TOPPLED, SNAPPED OR PUSHED OVER. 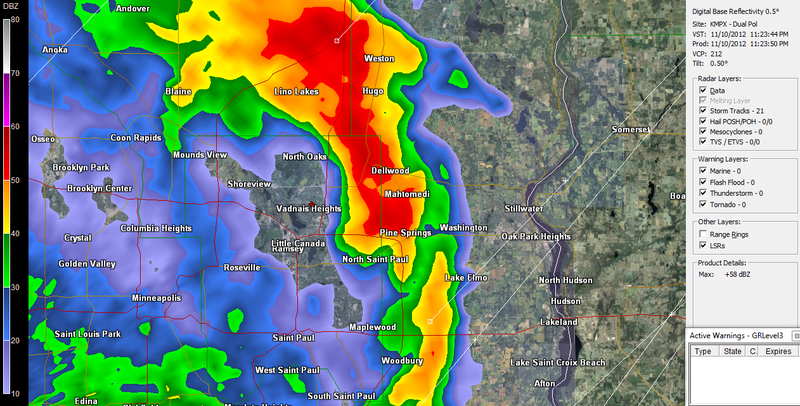 POINT THAT THE TORNADO TOUCHED DOWN IN FAR NORTHERN MENDOTA HEIGHTS. DAMAGE WAS IN THE MANY BLOCKS SURROUNDING DODD ROAD AND DELAWARE. ST PAUL WHERE IT MERGED WITH THE OTHER STORM. IN NOVEMBER...11/1/2000 NEAR PRINSBURG IN KANDIYOHI COUNTY. 11/16/1931 NEAR MAPLE PLAIN OF HENNEPIN COUNTY. 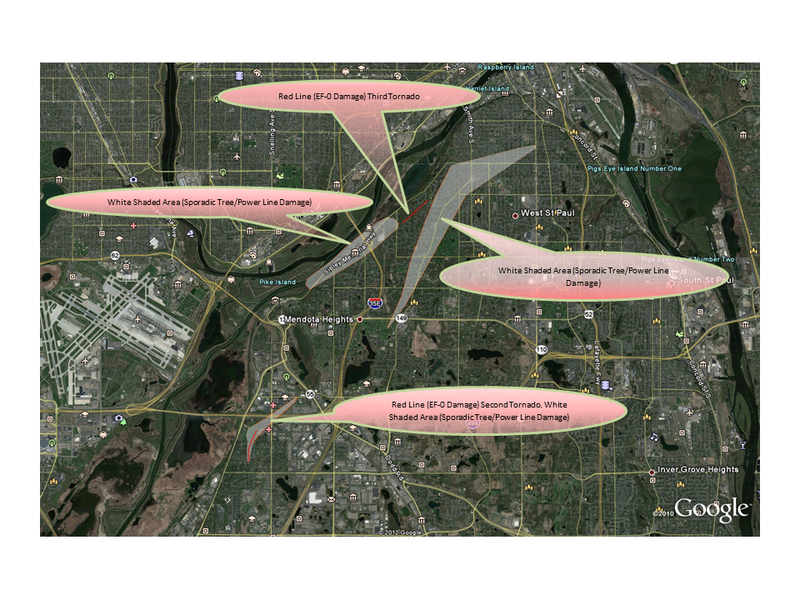 BASED ON ANY NEW INFORMATION PROVIDED OR GATHERED. 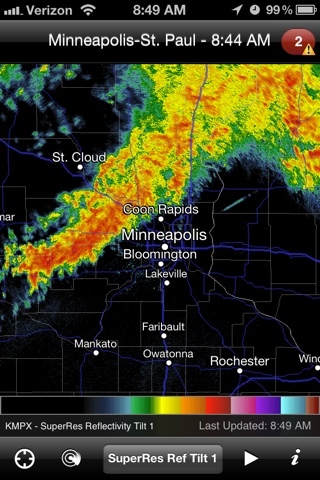 Get a text from a buddy asking if I'd taken a look at the radar recently. Since we were out with friends at the time I had not. But I quick opened my phones radar app to give a little demonstration and lo and behold, a nice well defined line was approaching from the west giving the appearance that it was June instead of November. And we knew what was coming next... Kind of. We made it home in time to pop out on our deck and enjoy a cigar and scotch while enjoying the last few minutes of 68 degree air. 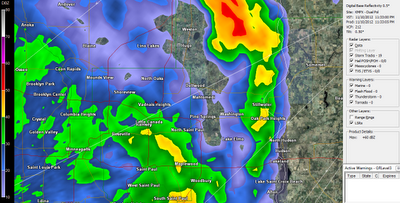 All the while watching the radar images become a little more than what we expected. 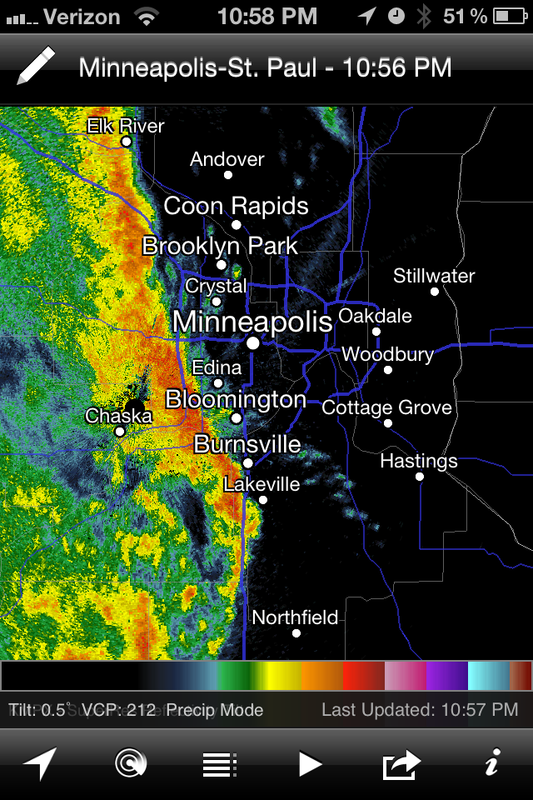 Here we see the line approaching the metro. 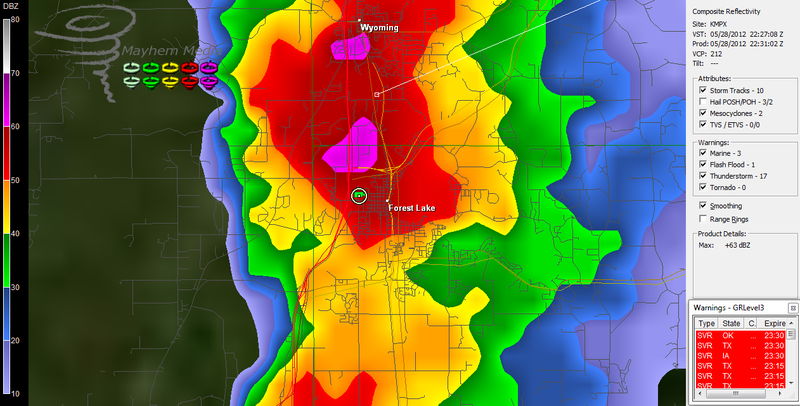 It was about this time tornado number one was forming according to the NWS. 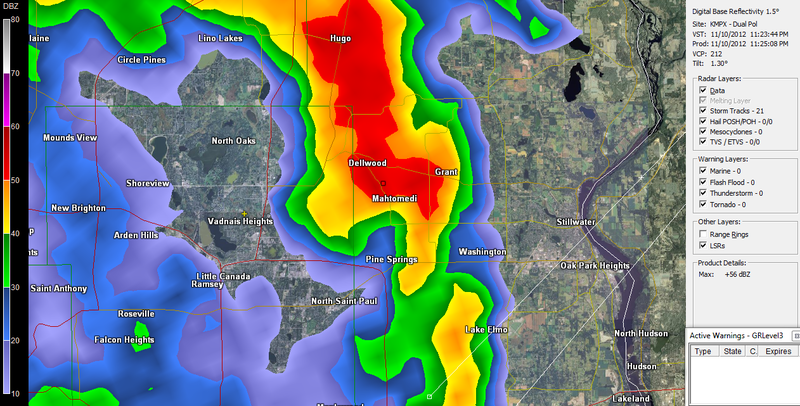 The appearance of this cell just screamed rotation. 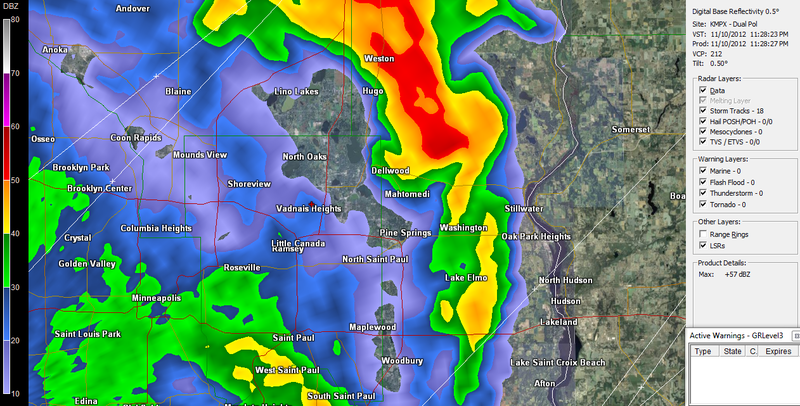 This was doing damage at this point in Mendota Heights. 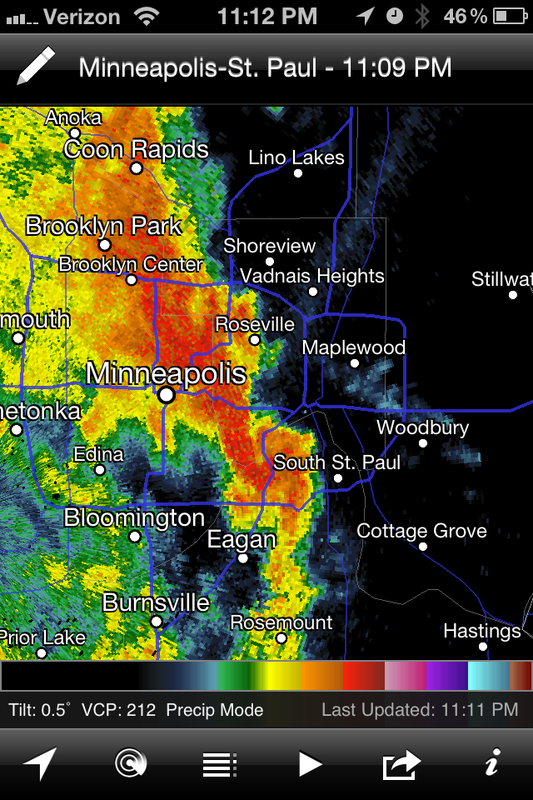 Here's the front as it drops several downbursts to the Northeast affecting Mahtomedi and adjoining areas. 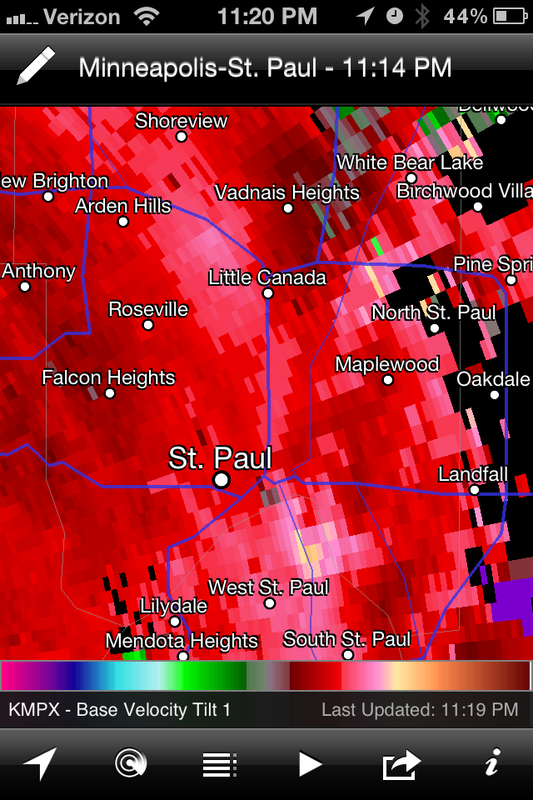 PAUL WERE HIT WITH WIDESPREAD DOWNBURST DAMAGE. RATED EF-0... FOLLOWED BY AN OVERVIEW OF THE DOWNBURST DAMAGE. 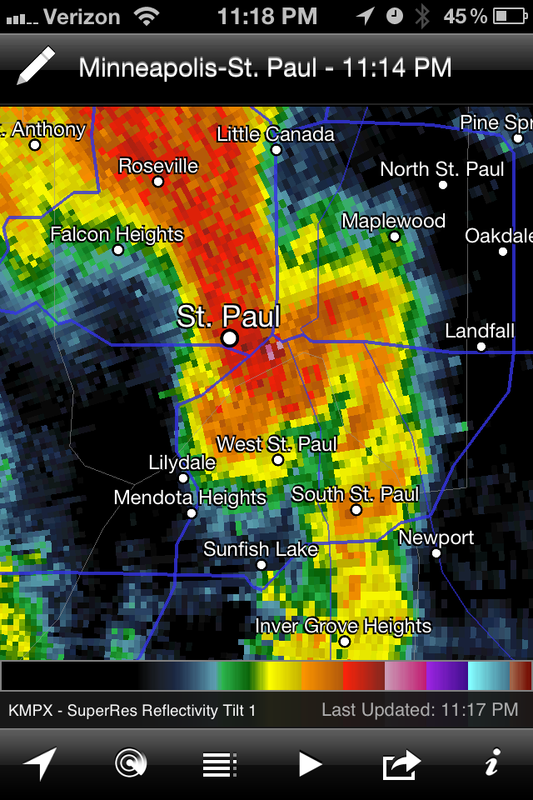 PAUL AND SOUTH ST PAUL. I'm addressing this question to my chaser friends who may happen to read this in the future. Ever have one of those chases where you second guess everything, and I mean EVERYTHING! from the beginning of the chase to the end? From your choice of target to the food and beverage you carry with on the run? 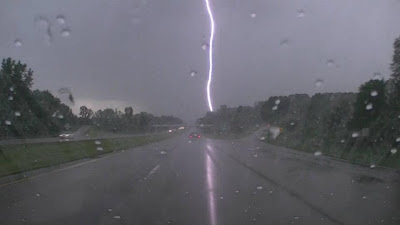 That pretty much sums up this chase day: Long, arduous, frustrating, and actually? somewhat fruitful. c.) You spend money, drive forever, and embarass yourself. Cells around the noon hour brought 1" hail to the area near my home. Perhaps I should hop in the vehicle and chase this as opposed to the setup forecasted for later in the afternoon out west? So, here's the Mid-day D1 TORPROBS: Not a bad setup. Close to home, but still a little hesitant. 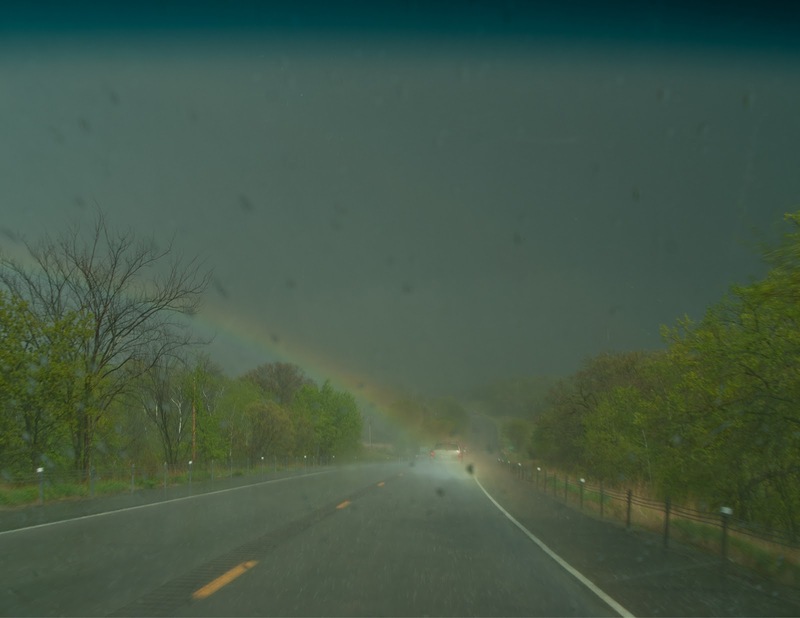 "You sure you want to spend the rest of the day chasing a possible rainbow? "Shut the hell up" I say to myself. Part of the reason I began chasing was to bring me to areas I wouldn't normally see. My travels don't normally take me off the main thoroughfares until I become close to my destination. Chasing forces me to change that way of thinking in that the destination becomes wherever the storm happens to land and my travel becomes the shortest route between two points. "Never knew that town existed." a lot. "You sure you want to continue?" Little Chase, now occupying the headrest right next to my right ear, asked to test the waters. "Yes" I said. "If things don't pan out here soon, We'll dive south on the next North/South." "DIVE, DIVE, DIVE!" things were getting more interesting down south of me. 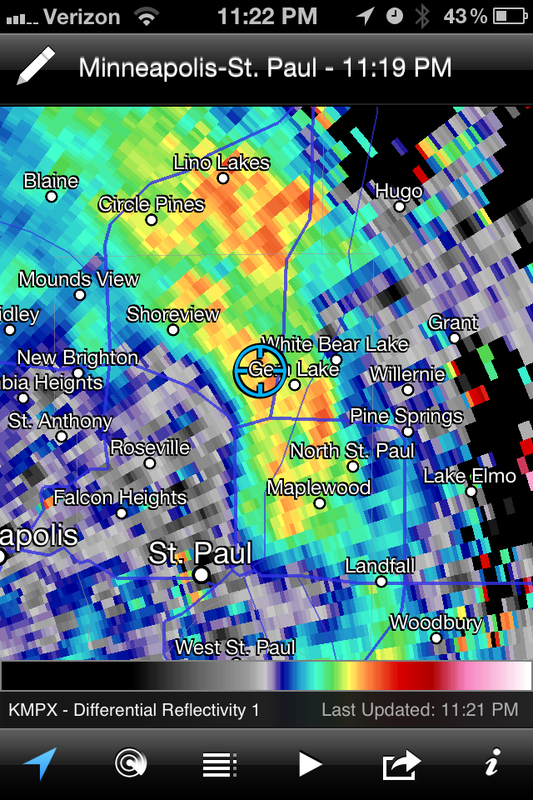 While traveling south on Hwy 169 the storm motion became faster than I anticipated. 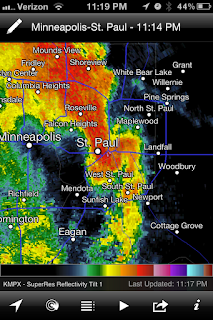 Causing me to get swallowed up by the storm. 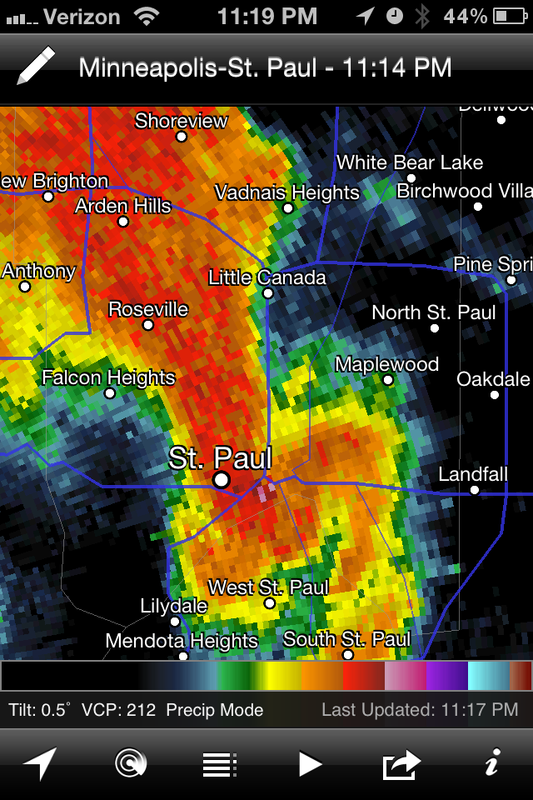 Part of this was caused by traffic on 169, (Who knew I'd be faced with a rush hour commute slowdown to St. Peter? 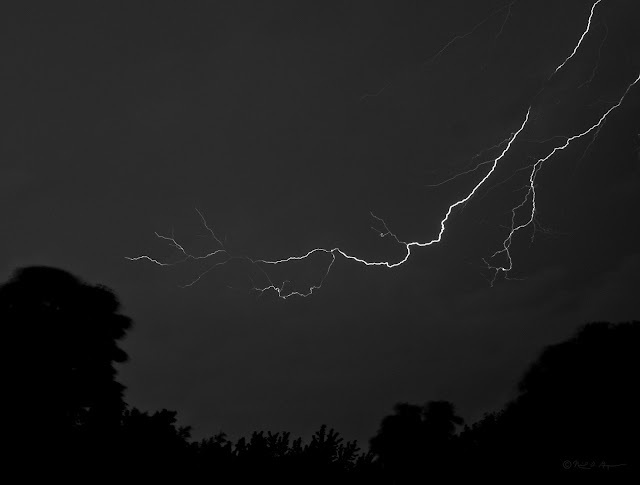 It did give me the opportunity to capture a C/G lightning hit less than a tenth of a mile from me and about 100 yards off the shoulder of the roadbed. Whatever was struck was still smouldering as I passed by the unfortunate item moments later. 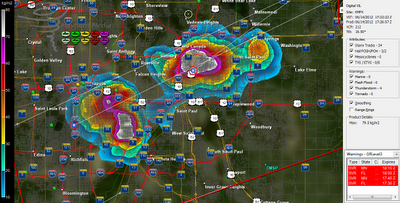 I purposely stayed behind the guts of this cell. Truth is, I just wasn't ready to core punch this thing while it threw off 1" hail just to the east of me. So, with most of the rotation now firmly out of my reach, I focused on a developing line to the west of Fairibault moving east. As I moved east on MN60, you could see the storm was intensifying steadily as it progressed. I decided to keep my distance. 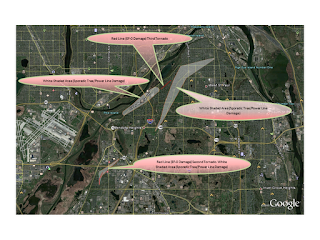 By the time I had reached Fairibault, the main part of the line had already come through and had caused significant flooding in areas around the lower downtown area. It was about this time I noticed that chaser Tim Purington had set up shop south of an area of circulation that had developed south of Kenyon and was moving north for an intercept. 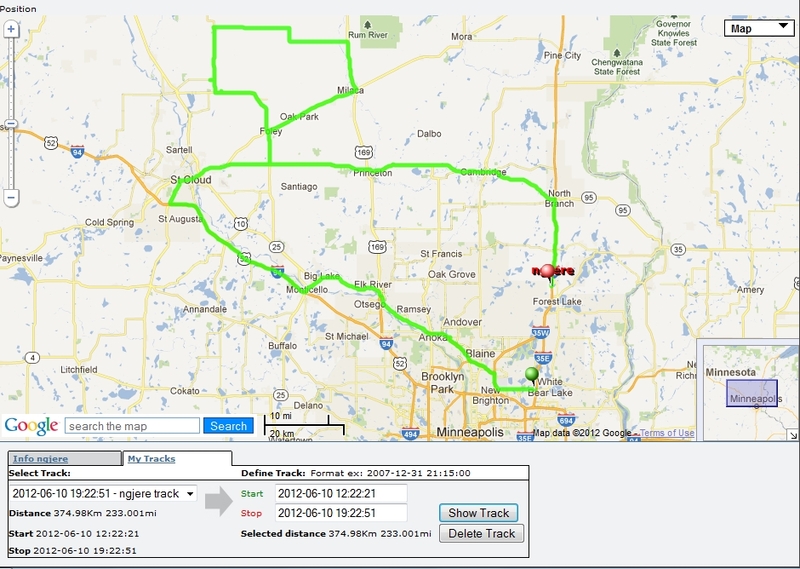 I continued east on MN60 behind the meaty portion of the line and watched it intensify even further until it was clear that a significant wind event was occurring just ahead of me. Tim Purington intercepted and was swallowed by the core. He tweeted later that it was one of the strongest wind events he'd ever experienced. Significant damage was noted to several out-buildings between Kenyon and Wanamingo along with trees and power lines. The trip back to the cites included travel through an area of storms that ended dropping 6-8" of rain in a short period of time causing MN52 to be closed due to flooding. Trying to get caught up on some of my chase logs since things are going to be quiet for a bit. Probably the shortest chase of the season for me. A small line of storms formed out to the west and gave some appearance of intensifying if it met a more favorable environment which happened to be just to the NE of the cities. 15 minutes after pulling the trigger, I was sitting in a parking lot just off I35 waiting for the approaching cells. One portion which ended up passing right over me, showed the most possibility with a fair amount of updraft associated with the line. Certainly gave me reason to hang for a bit. 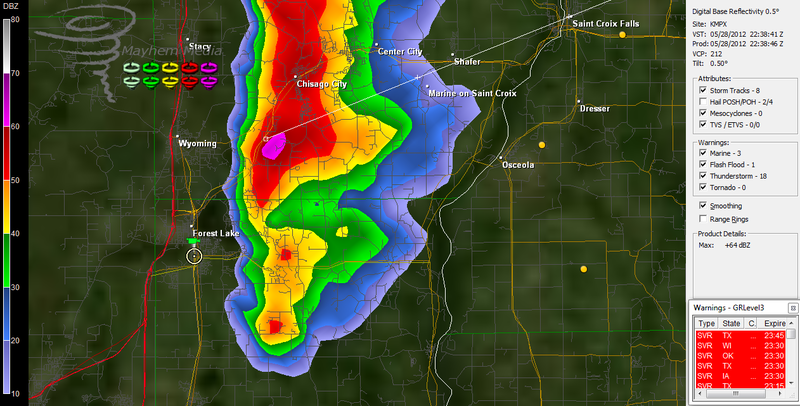 Unfortunately, the gut was telling me it wasn't going to produced given the lack of local shear to get things spinning. 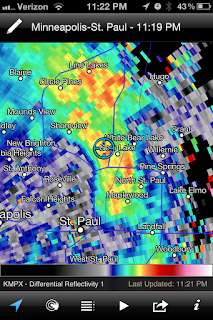 I did decide to follow the movement of the storm briefly but, Forest Lake ended that choice quickly by cutting out a lot of east travel options. 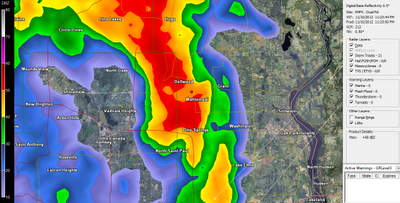 I did note a rather brief funnel over the lake but it dissipated so quickly as to be non-reportable. And I wasn't in a position to record it so, as the rules state: "It didn't happen"
As I said, Probably a total of 90 Minutes start to finish for this chase. More often than not, these bust quickly. But for that small percentage of time they don't? well, I would've had it all to myself. That day is coming. I can feel it. Will bring a focus to a greater severe weather threat this afternoon. Keep tuned to media throughout the day for watches and possible warnings. Well, this one was a coin flip. North or South. Models were hinting at initiation north earlier in the day as the cold front slipped in from the Dakotas. 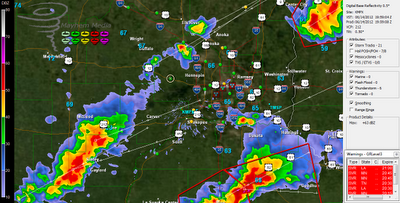 So I decided to hedge my bet and while focusing for a northern storm, give myself an out for a South/West reroute. Highway 10 became my initial route while eyeballing Milaca MN as my target for initiation. 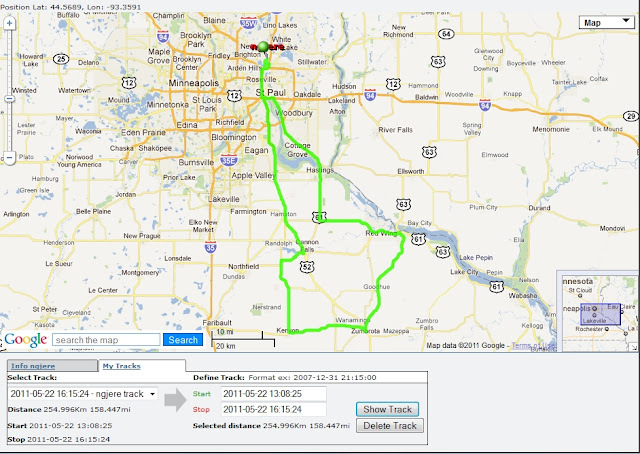 As I proceeded up MN Hwy 10, it appeared that initation would occur west of my position so, rather than travel up Hwy 169 as originally planned, I dove across to Hwy 94 from Big Lake. As I continued up 94, the cells originally observed on radar came and went. Chose to sit for a bit in St. Cloud MN to see how things would firm up. Towers began to appear to my west giving me some hope I'd made the right choice. 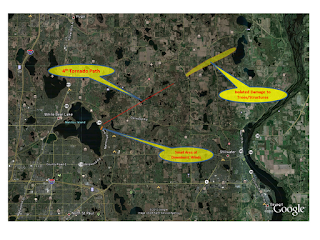 I decided to continue with my original plan of parking in Milaca MN as the line progressed eastward letting the line come to me and maybe lessen the driving a bit. As predicted, the storm mode began as broken line segments but within an hour or so began to line out. I was really hoping for cells to hold together separately for longer but, I took the gamble and lost that bid. 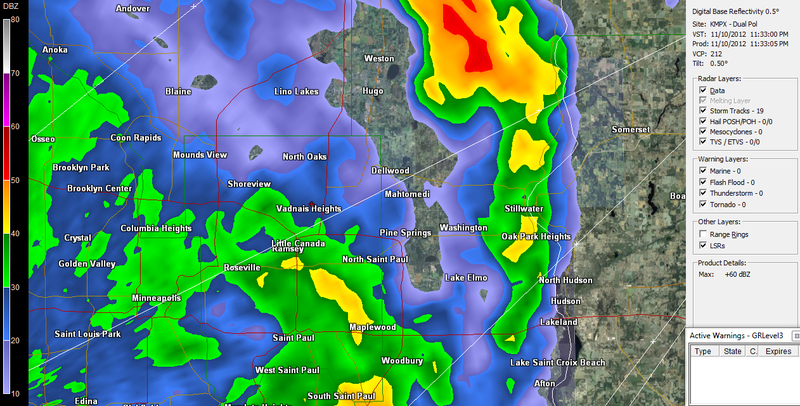 I ended my wait in Milaca and took off North to grab a part of the line that appeared to be intensifying. By this time it was pretty clear my chase day was over for seeing any tornadoes but maybe I could salvage it grabbing some structure and lightning shots. 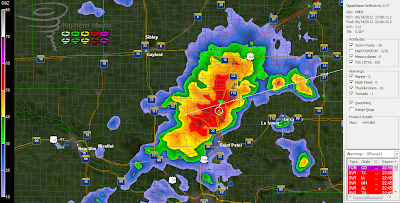 Grabbed a nice 6 shot panel as what remained of this cell approached me in Benton County at MN25 and Co. Rd 12. Well, work will get in the way of this setup so I will be sitting this one out. 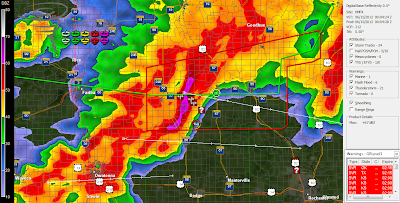 For all you chasers however remember, this is Wisconsin not the Dakotas. 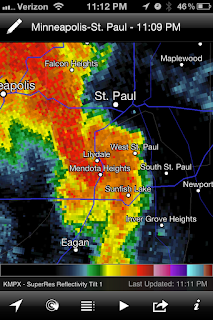 Storm speeds and road options will conflict today. Be safe, Be Smart! 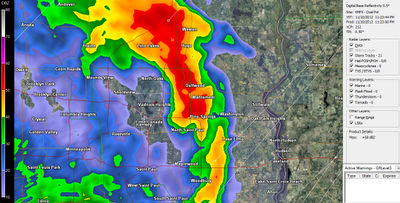 Today marks the one year anniversary of the North Minneapolis tornado. Coincidentally, it also marks the 1st anniversary of the F5 tornado that hit Joplin MO later the same day. Since I never did post a log for this chase last year, I'll post it as a remembrance. I decided to chase the southern line but got a late start due to my waffling about and re-thinking the setup. 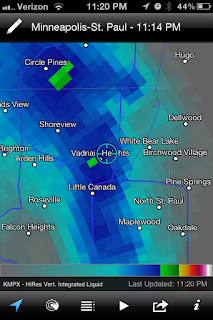 Of course, hindsight now says "you should've stayed home" But I was looking to chase a line that was forming parallel to Hwy 52 south of the cities. But, I sat in the driveway just long enough to put me out of play no matter how far and how fast I dove south. It completely blew my intercept timing. 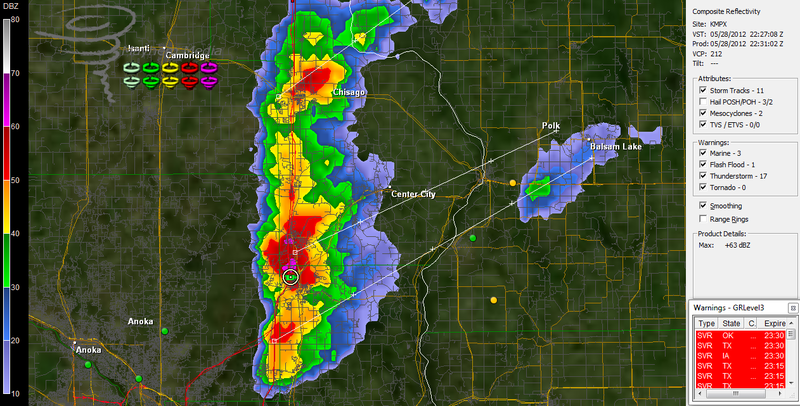 So, I played "catch as catch can" and I set my sights on a cell just passing to the north of Kenyon MN. Perhaps the near miss I had in Randolph MN the year prior would average out and I'd get the goods since no one else was on the storm at that time. Urrgh. 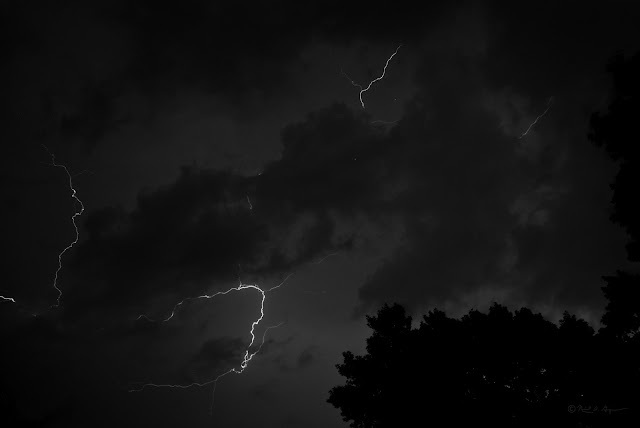 It was the realization that I could have mowed the lawn, had a beer, got in the truck for a lazy 5 mile drive to intercept the Forest Lake storm had my senses told me to stay in the driveway. 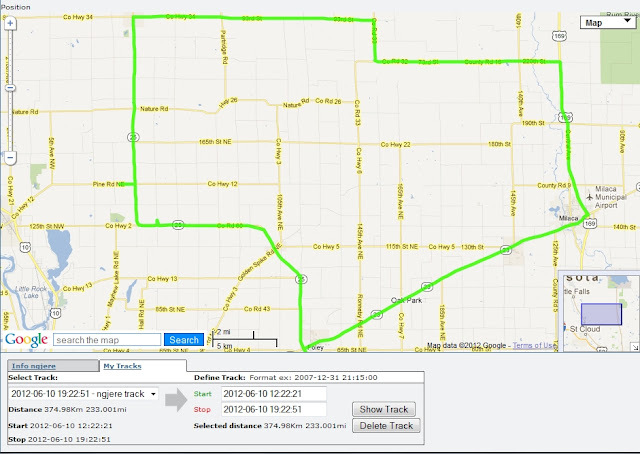 Instead, I took the 158 mile round trip to bustville. 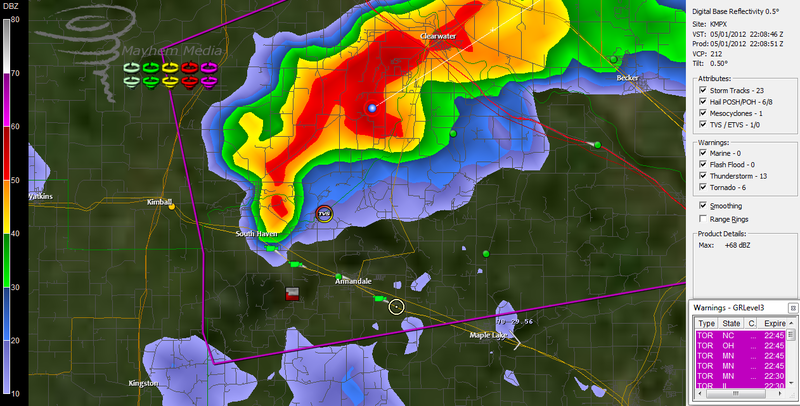 Licking my wounds, I headed north for home while monitoring the radio for damage reports. The final kick in the gut was the later activity in SE MN and SW WI that I could have gotten in on had I aborted the first chase of the day and concentrated on getting deeper SE. But the worse was yet to come for Joplin MO. Here is the summary of that horrible outbreak from the Springfield MO WFO. Took the day off to chase this setup. Didn't get the prize, but wasn't disappointed either. 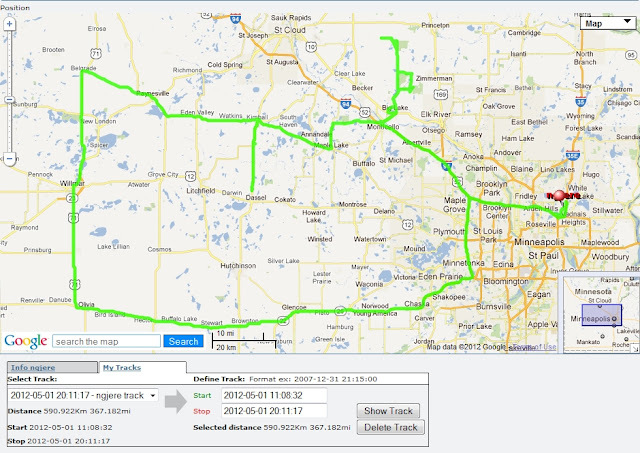 My original forecast was to head to Milaca MN and adjust as the day went on. 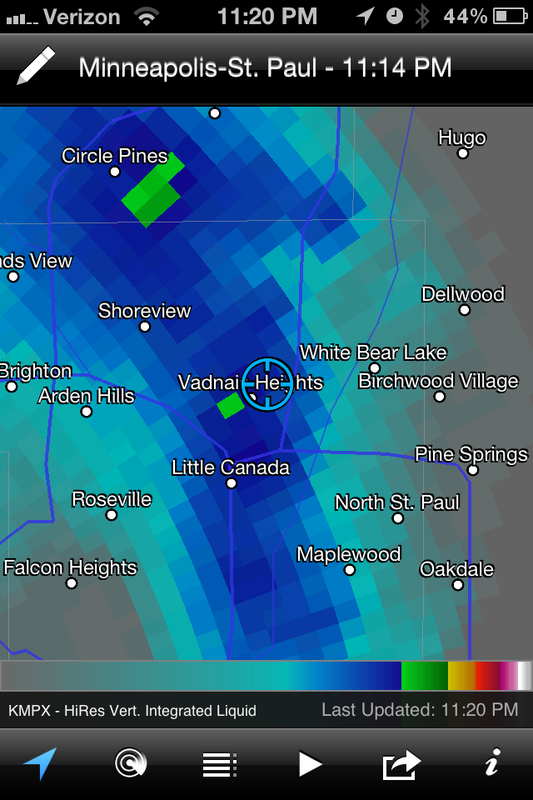 That plan was thwarted almost immediately after looking at cloud cover in the area. 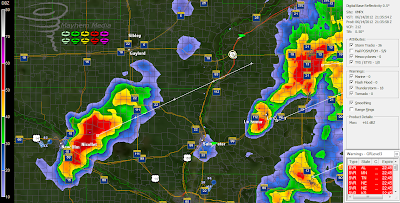 Instead, I chose to head west where more favorable clearing and surface heating was taking place. 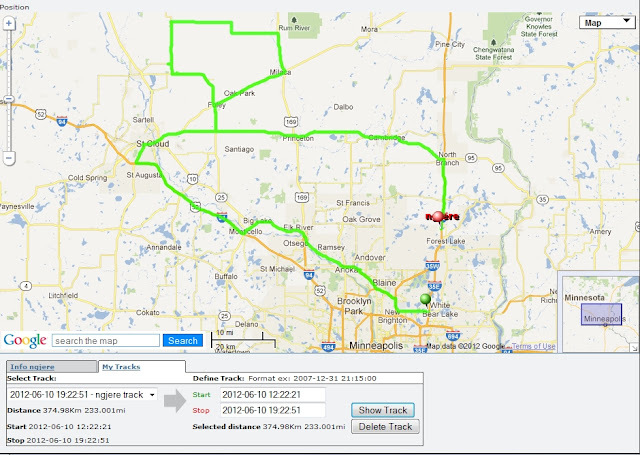 Decided Hwy 212 would be my best option and headed west toward Olivia MN. By the time I reached Glencoe later in the afternoon, it was pretty clear the atmosphere would play nice along the dryline. Towers were clearly going up. Question was, how far further west would I have to go to intercept? Olivia was a pretty good guess given that temperature profiles showed my position very close to the dryline yet, I found myself adjusting north later on with later temperature updates. 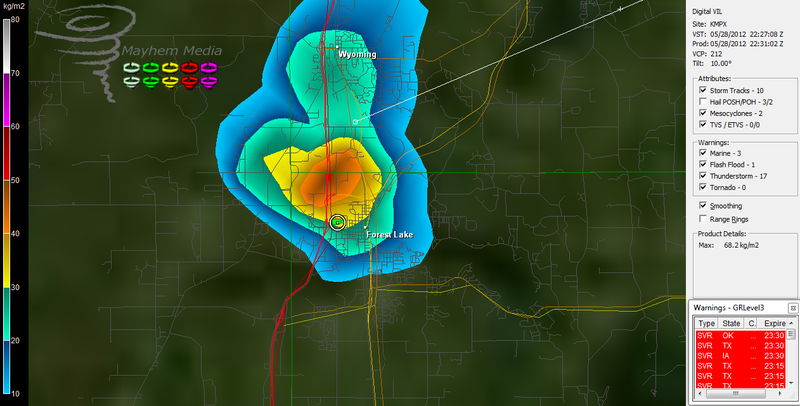 First cell to catch my attention appeared just west of Eden Valley. 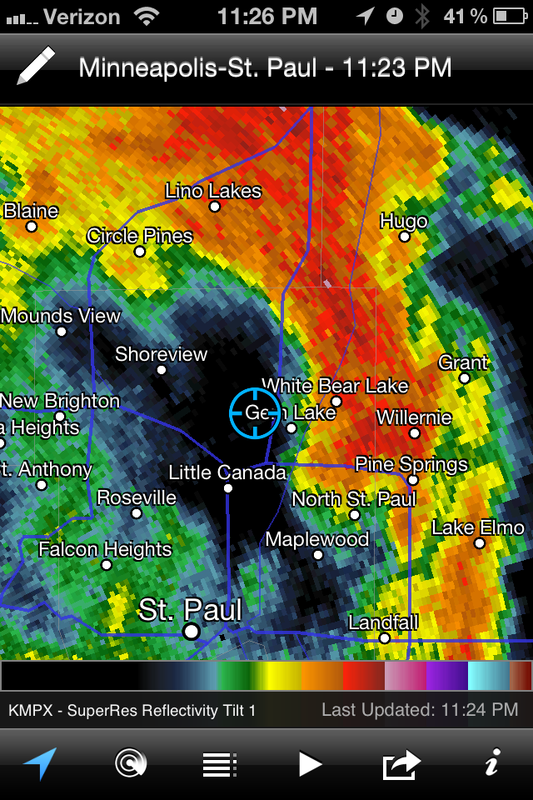 Saw some great structure en route, but distance kept me from being under it. Appeared to be more of an ice maker than anything else. A much more promising cell popped up just behind the Eden Valley one. 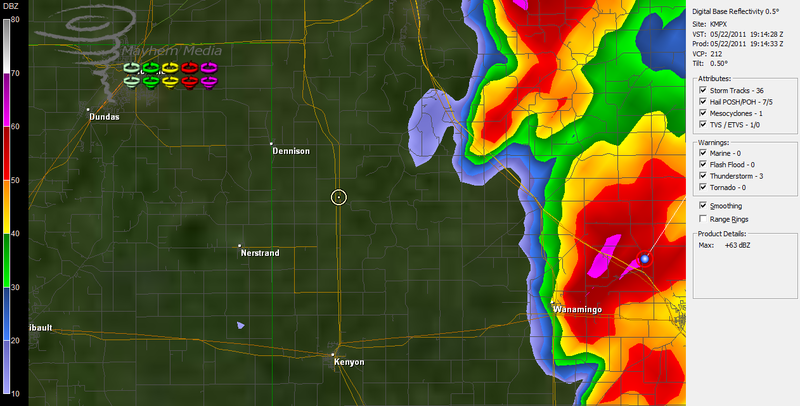 Dove south on Hwy 24 from Kimball to intercept and it too, failed to produce. Stopped for a moment to chat with John Wetter and his chase partner on a side road as I was travelling south. I was ready to pack it in locally and head south west but John reminded me that the group of cells we were on presently was the "game in town" because of the backing winds supplying fuel to the line. A good call on his part. I heeded his observation and stuck around. 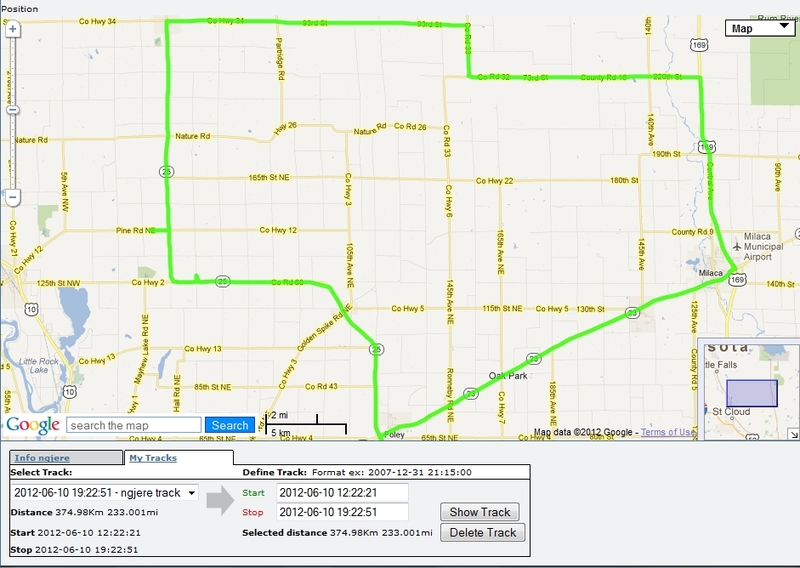 Heading back north on 24, I decided to take a few minutes and monitor progress on an access road just off the Highway. Shortly after, I was joined by Andy Revering, Shawn Hewitt and another gentleman who seemed to be on his first chase. 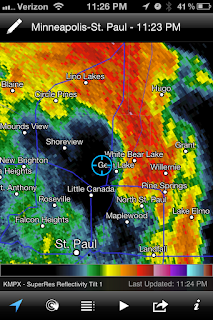 As we chatted, we noted a lowering of the base of the cloud directly west of us less than a half mile away. This gave us all pause for a few moments as it really looked like it was going to produce something. Shawn pointed out that it wasn't connected to the parent cell to our north and was unlikely to produce anything. His observation was correct and soon the wall lifted back into the base. They were kind enough to let me tag along with them for the remainder of the chase. The decision was made to catch up to the parent cell further north and track that for a bit. 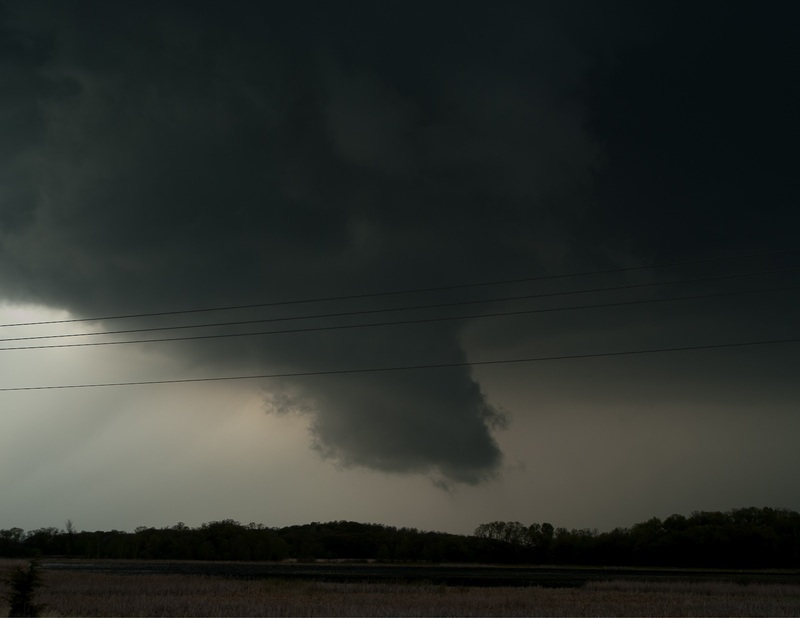 Our most promising moment for a close encounter was on the east side of Annendale MN where a wall cloud that was rotating subtly was about two thirds of the way to the ground. Stopped at the end of a driveway off the highway to view the wall cloud's progress when the owner of the property joined us and joked with us for a few moments while we snapped photos and shot video of the slowly diminishing wall cloud. We appreciated his hospitality and thanked him. 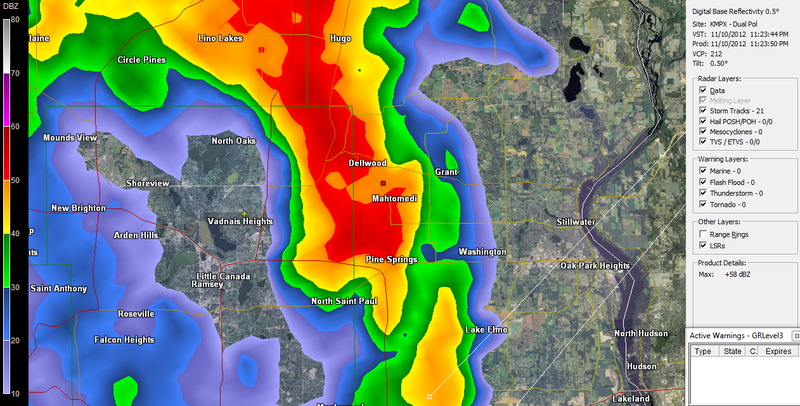 Since the storm we were tracking appeared to be getting into a more stable environment, We decided to end the run on this one and focus on cells now percolating over Sauk Rapids. 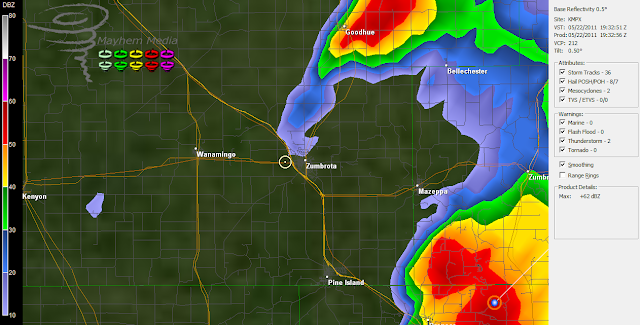 After a fuel stop in Monticello, We bolted up to the north in the hopes of intercepting a cell that was now east of St. Cloud travelling E/NE. 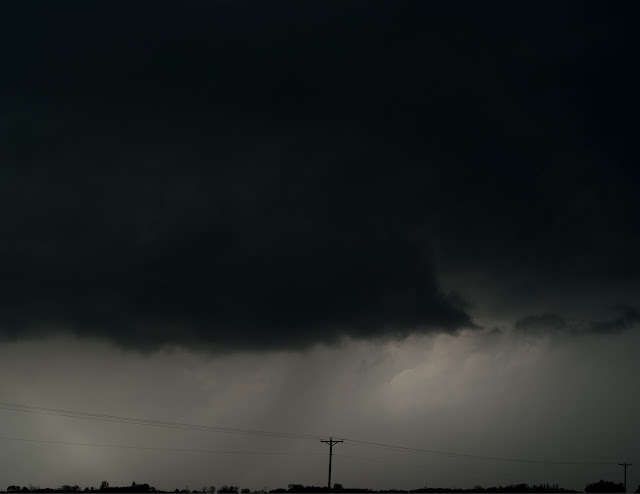 We ended up settling for a roadside view of the action about 8 miles to the east where we were treated to a well defined rotating wall cloud that was on the verge of producing. With light fading fast, it was fairly evident we weren't going to be treated to a tornado. 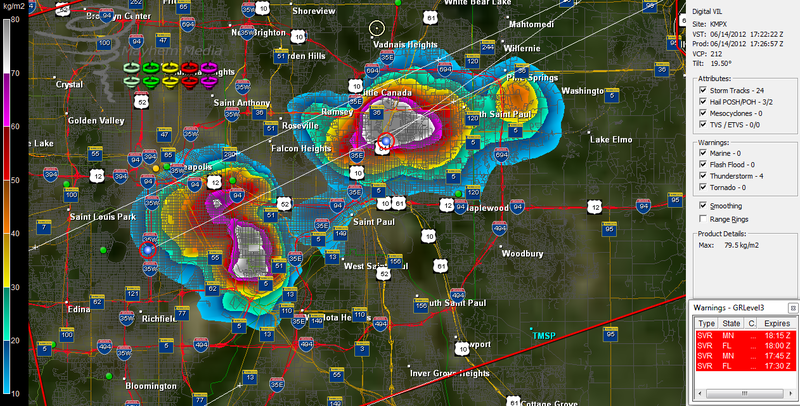 But, plenty of hail was on tap for those who stuck around. We decided against getting bombed and headed toward home.